Anybody who has ever dated me, lived with me, or really has known me knows that my two most favorite desserts (in this order) are my Grandma Schwartz’s Blarney Stones and then crème brûlée. I’m not a huge fan of chocolate so when dining out my first go tos are the aforementioned and then cheesecake. I have had brûlée twice in my life that actually WOWED me. I may be an atypical brûlée eater in that I love a super caramalized top, but I also like the creme to be just a little bit warm. I don’t want my dessert straight out of the refrigerator. Related, but on a different note, it is also VERY hard to find what I feel is exceptional pizza. So, my quest begins to create the perfect pizza and the perfect crème brûlée. My roomies will find their role as taste testers arduous I’m sure. However, today’s post IS NOT about crème brûlée, it’s about grapefruit. I love grapefruit, I grew up having it fed to me bite by bite via spoon by my grandmother (much past the age when said action was necessary, mind you). Carefully layered in sugar, after every last bite was scraped out, we would squeeze the thing to death to make sure we got each little droplet of juice either into the spoon or sprayed onto our face. 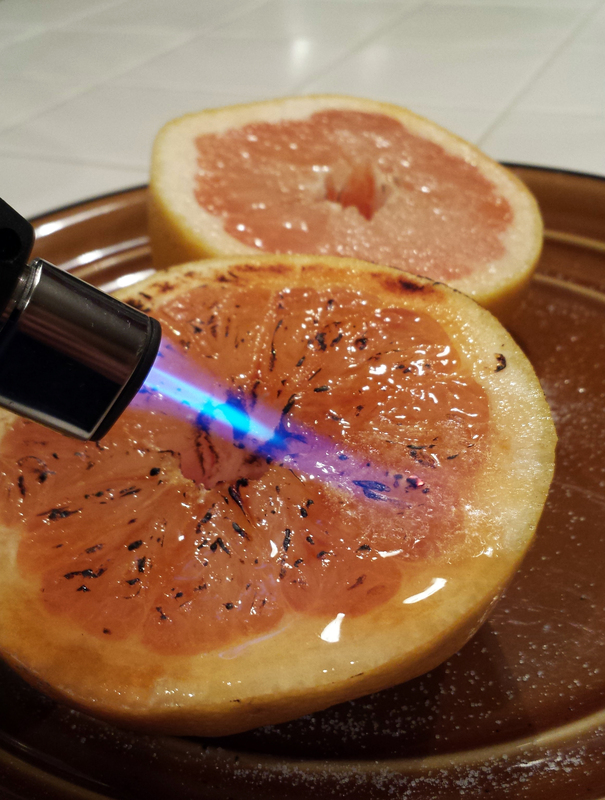 So, when the “broiled” grapefruit trend became popular I was like “NO WAY!” grapefruit is fine just as it it. But, my curiosity got the best of me and I tried it. Gross. How DARE anybody take a beautifully crisp citrus thing and make it into a warm mushy acidic sullied mess! I threw it away. I couldn’t even bare to look at it let alone eat it. Months later, I no longer remember how the topic came up, I was explaining to a friend my dismay with wanting it to be delicious and having the result be quite the opposite. This dear dear friend of mine, whom I joke with as being my soul mate (because let’s be honest, we are) Sharyn Jackson informed me that to prevent the nasty warmness but still get the caramalized crispy sugary coating (that smells like cotton candy!) just use a crème brûlée torch to toast the top. Folks, my life has been changed forever.It was delicious, a duality of crispy citrus and caramelized sweetness, warm crusty top and cool juicy below. Give me all the brûléed grapefruit. That’s it. That is all there is to this post. Just try it, your life will be more delicious because of it. This entry was posted on Tuesday, February 25th, 2014 at 2:37 am	and tagged with Blarney Stones, crème brûlée, Grapefruit, pizza and posted in All About the Eats, Mada(M)useo. You can follow any responses to this entry through the RSS 2.0 feed.